One of the most common specs you will see on most android speaker docks is the Wattage. Wattage defines how much power the speaker can take from the amplifier, for example 100 watt speakers can take 100 watt input power from the amplifier. Manufacturers usually indicate maximum wattage for all speakers. Inputting more power than allowed by the manufacturer may damage the speaker, however high quality, powerful speaker may require even larger input power than indicated on the unit. For best overall performance try using approximately the same input wattage as indicated by the manufacturer. There are two common terms used for describing wattage – RMS and Peak. RMS defines continuous power that the speaker can take in longer period and Peak power defines the power a speaker can take in short period before it gets damaged. What you need to take into note about wattage regarding android speaker docks is that it is not directly related to the sound quality or loudness of the unit. For example 100 watt speaker will not necessary output two times louder sound than a 50 watt speaker. There are other aspects to consider such as sensitivity of the speaker that indicated how loud the speaker is and how much quality you can expect from the speaker sound. Read more on speaker sensitivity below. There are different opinions whether the size of the speaker improves the loudness of the speaker. Generally speaking, larger drivers should provide more powerful and louder sound than smaller speakers. Larger sized speaker is going to move more air, so generally speaking it should be louder. But in reality, it depends on many other factors of the speaker such as the speaker box, cone material and size and many other factors. Speaker and subwoofer drivers differ in their size as larger drivers provide lower frequency sound and are used for bass, while smaller drivers provide higher frequency, which is better for speaker drivers. 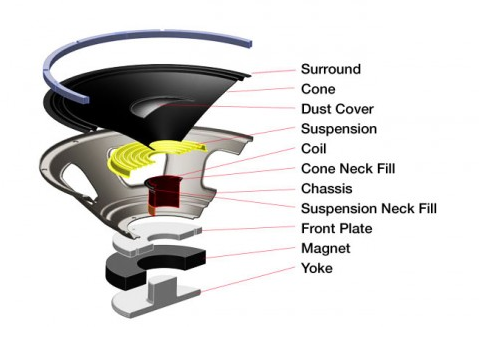 It can be explained with the cone size that lies inside of the driver, larger cone will be moved slower by the air so it is going to output lower frequency while regular speakers have smaller cones than can be moved faster and are going to output higher frequency sound. Choosing a speaker with the right driver size may be more challenging for home audio systems or home theaters than it is for speaker docks. As most of the speaker docks are not capable of challenging a sound quality, loudness and power of a home audio system for couple hundred or even thousand bucks, it is easier to purchase a good quality speaker dock. Generally, a speaker dock with larger drivers is going to output more powerful and louder sound and usually will have better speaker box, larger wattage, and better sensitivity and will cost more than other speakers. Most android speaker docks come with a single or two drivers and may have a built in subwoofer. Basically, two speakers will give you richer and louder sound, while a subwoofer will provide more bass and will output more powerful sound. The frequency response explains the frequency range of the speaker. The frequency range is measured in Hertz. When a speaker gets a constant input signal and certain frequency it will produce certain level of loudness. Good speaker should try to keep the same output level with the same inputs, changing just the frequency. Basically, frequency range shows how low (bass) and how high (treble) sound the speaker can output. An average human can hear sound in 20Hz to 20kHz range. Generally, this would be the range to look at when purchasing a speaker. However, practically the frequency response tells us just a little about the actual sound quality and loudness of the speaker. There are two numbers that defines the frequency range of a speaker, an example would be 50Hz – 20kHz (20 000Hz). The first number – 50Hz, shows how low sound can the speaker produce or how deep bass can a speaker produce. The second number – 20kHz shows how high sound the speaker can produce of how much treble it can produce. You will often see additional numbers such as +/- 3dB, which shows the amplitude tolerance of the speaker, because speakers don’t produce constant sound in all the range. When purchasing and android speaker dock, you can look at numbers in range from 50 – 40 Hz and lower for good level of bass and 20-22kHz for good highs. However, in reality these number means little, when looking at the overall sound quality of the speaker, and there are no standardized methods of measuring the frequency range of the speaker, so each manufacturer can interpret it how they want. The best way to tell which speaker has better sound quality is to actually go to an electronics store and test and compare different speaker to understand which speaker sounds better for your ears. Sensitivity of the speaker is also an important factor to consider when purchasing speakers. Sensitivity shows how much loudness a speaker will provide per one watt of power, measured in Ohms. Higher sensitivity speakers are going to be louder with the same amount of input power than speakers with lower sensitivity. The sensitivity of a speaker can be measured by powering the speaker with one watt from the amp and measuring the loudness the speaker outputs in one meter distance. The sensitivity rating of approximately 88dB is the standard for the most speakers. Wattage and sensitivity rating are two specifics that tell how loud the speaker is going to be. However, this is the number that you will see much less than wattage, driver size or frequency response when purchasing a speaker dock. Most manufacturers do not indicate the sensitivity of the speaker for docking stations. Channels – 1.0 mono, 2.0 and 2.1 stereo. A lot of android speaker docks and Bluetooth speakers come with just a single channel (mono speakers). You can find mono speakers in smaller and cheaper android speakers and alarm clock docks, as well as universal docking stations and portable Bluetooth speakers. Mono channel speakers are inferior to dual-channel and multi-channel speakers in many ways, such as sound quality and loudness, a range of sound, and also power, as mono channel speakers usually don’t come with a subwoofer. You can consider a 1.0 speaker more like an enhancement for smartphone or tablet built in speakers as they also have a single-channel speaker. 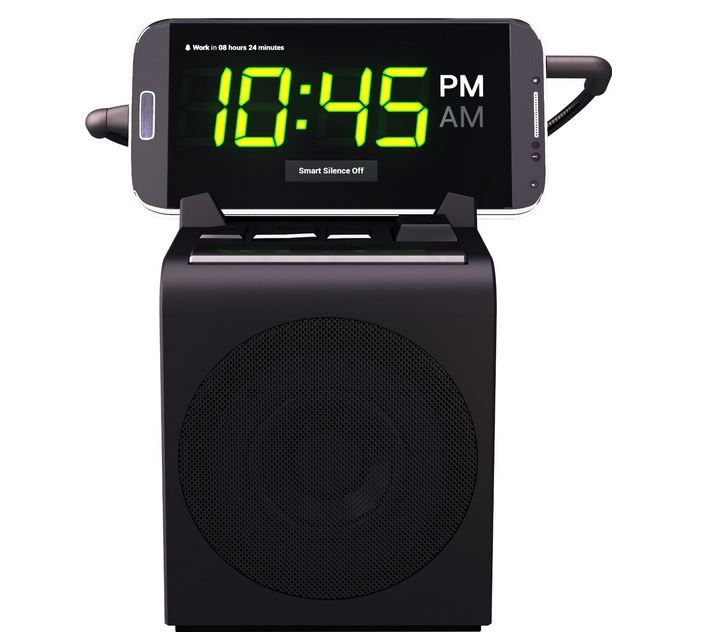 Docking stations with a mono channel speaker usually provide significantly louder and higher quality sound than a built in speaker of a smartphone, but at friendlier price range than multi-channel speakers, which makes them a great addition for smartphones and tablets for listening to music, playing games or watching movies. 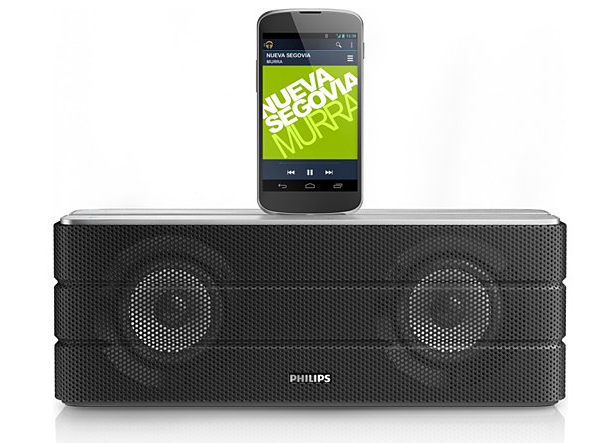 The most popular speaker system you fill find in android speaker docks is 2.0 channel or stereo speakers. A 2.0 channel android docking station has one left and one right speaker, without a subwoofer. 2.0 channels is a simple speaker system that can be found in computer speakers, portable speakers and android docks. The amplifier is usually mounted inside one of the speakers. 2.0 stereo speakers have significant advantages over 1.0 mono speaker. Because dual-channel system has both speakers separated one from another, it gives much fuller and wider sound than mono-channel speakers. Although 2.0 channel speakers don’t have a subwoofer, they still can output good overall sound quality with some level of bass coming out from their built-in woofers. The mono-channel speakers usually are not capable of producing the same amount of bass as dual-channel speakers. When compared to 2.1 channel systems, 2.0 take up much less space as there are just 2 drivers and no built-in or dedicated subwoofer that takes up additional space. However, 2.0 channel speakers cannot be compared to a 2.1 channel system in amount of bass, because a 2.1 channel system has a separate subwoofer. In android docking stations 2.0 channel speakers are usually built into a single unit and cannot be separated. Same as with regular 2.0 stereo speakers, android docks with 2.0 channel speaker system offer better and more powerful sound over 1.0 mono channel speaker docks. 2.1 channel speakers are less popular in android docking stations and can mostly be found in higher-end android speaker docks. 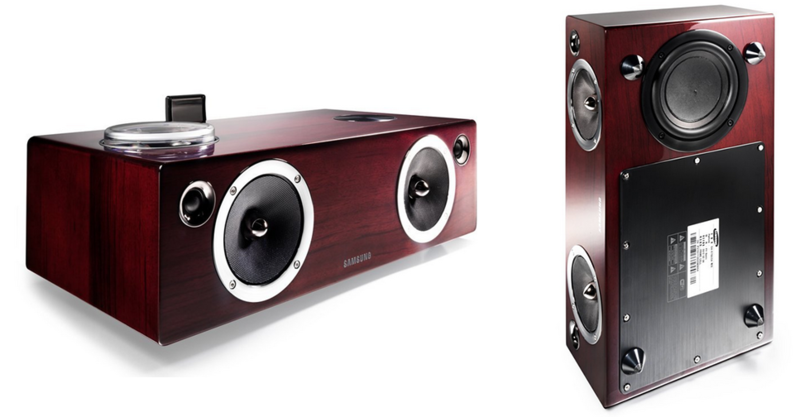 A 2.1 channel speaker systems differ from 2.0 channel systems with an additional subwoofer. Both systems have two separate channels, however, 2.1 systems features a dedicated or built-in subwoofer for extra loudness and power. 2.1 channel speaker systems sometimes even have smaller channels than 2.0 channel systems, however the outputted sound from these speakers has much better lows and bass thanks to a subwoofer. 2.1 channel speaker systems have a broad usage starting from sound systems for TV’s and smaller home audio systems, to speakers for computers and are also used in android speaker docks. As mentioned above, the advantage over 2.0 channel speakers is the additional bass response from the subwoofer, which gives more powerful low sounds and bass. 2.1 channel speakers are found in high quality android speaker docks, that are designed to give rich, full, loud and powerful sound in pleasant quality that are not only suited for a regular listener but will also fill needs of a more experienced music lover with broader music taste.